A chimney fire. That’s how we got started. In most cases, the idea for a new product usually comes from a real need. That’s the story of SmartBurn’s humble beginnings. 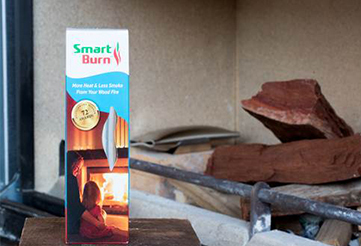 Following a chimney fire, and after 5 years of trial and error, the SmartBurn tube was born in a shed in Gelorup, Western Australia, by Inventor Peter Hutchison. Fast forward 12 years and we have grown from supplying 2 retail outlets in 2005 (Sydney and Launceston) to 1094 nationally today! And whilst technology has changed and the factory is bigger, our commitment to delivering a high-quality product that promotes a high level of customer satisfaction remains the same. As a family-owned business, we understand the need for good quality products that are affordable, truly usable, packed with features and most importantly safe to use. We pride ourselves with ensuring that every SmartBurn, designed and manufactured in our Western Australian office, is of the highest standard of quality and reliability. As a proudly Australian owned company, our preference is to support locally made products wherever possible. How we source our ingredients, to our suppliers, to how we approach every element of our business, is done with an uncompromising commitment to support local business. To us, a few extra dollars is worth knowing that we're contributing toward the livelihood and dreams of one of our neighbours. SmartBurn has won 72 National, Regional and Community Awards for Environmental Sustainability, Innovation and Excellence since its launch, and continues to grow and thrive through the support of our customers. This support has allowed fostered growth from humble beginnings, to the business standing today, with no intention of stopping anytime soon! So it is with pleasure we pause from our usual routine to say “Thank you” for your purchase, your feedback, and the many hand written letters that flood our letterbox every year. We greatly value your trust, the confidence you have placed in us, and for continuing to make us, this local small business successful.